From a man that teleports out the way of a speeding train to a mysterious scientist that appears in front of a truck, join us as we take a look at 6 teleportations caught on film. Let’s get straight into it with this bizarre appearance in Penza, Russia. This clip shows two men and a cameraman discussing something on a street, when out of nowhere a man on a bicycle appears and rides away. Slowing it down, there’s no possible way the man and his bike were hiding behind the guy in the foreground. Is this a glitch in the footage or has this old man appeared from somewhere else entirely? 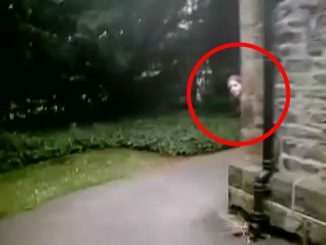 This clip, taken in an unknown location, began doing the Internet rounds in late 2015. It’s some dash cam footage that shows a four wheel drive changing lanes. As it merges into the right hand lane a man appears out of nowhere. He tumbles onto the road and disappears out of shot. Many have noted that it’s possible the man was riding on the bonnet of the four wheel drive before he fell. This is a plausible explanation as we can’t actually see the front of the car. But why would anyone do that? Or could it be this man has teleported from another place in time and space? This is a very old clip that first aired on TV back in the 90’s. It captivated audiences, leaving them wondering whether the police filmed a real ghost car. 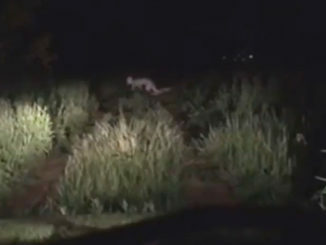 The dash cam footage shows a police car in pursuit of a runaway driver. The suspect is driving erratically all over the road when his final turn leaves police baffled. Many have offered explanations for this footage. Some say the car flew through chain link with enough force to slide under the loosely attached fence. Others have noted that there’s a gap to the right of the fence that the car may have driven through. Then there’s the paranormal explanations: ghost car, aliens, teleportation? What ever the case may be, it’s some amazing footage that has raised eyebrows for decades. This is some dash cam footage taken in an unknown location. It shows a semi-trailer swerve across the road nearly hitting oncoming traffic. Inexplicably, a man in a lab coat appears alongside the truck. It’s as though he has teleported from out of nowhere, forcing the truck to take evasive action. The man then wanders dazed and confused to the side of the road. What do you think? Is this just really clever editing or a glimpse at a genuine teleportation? This security footage was taken on December 20, 2015. 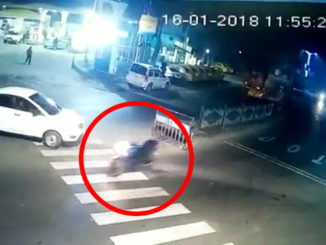 It shows a man riding a motorbike up a road. As he approaches the hill, his bike stops seconds before a train speeds by. You can clearly see him struggle with his bike right as the train hits. Then, not even a second later, he reappears running down the hill. Where did his bike go? How did he get back on this side of the train tracks? Is it some kind of anomaly with the footage or has this man blinked himself to safety? This security camera has captured something quite alarming. Taken in an unknown location, it shows a hooded figure walk straight through a door into a shopfront. The lights flicker inside the store then the man walks back through the locked doors and out of sight. If you look closely, the time stamp on the security footage flickers between 2016 and 2019. What do you think? 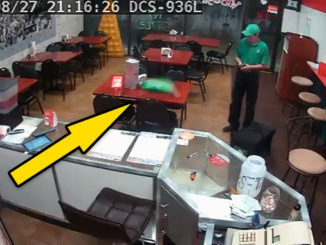 Elaborate hoax or proof that this teleporting, time traveler just wanted a quick bite to eat? So there’s our list of 6 teleportations caught on camera. Did this listicle make you believe that there’s time travelers really teleporting through time? If so, let us know on Twitter and Facebook.